Despite competing with a nasty stomach illness, Lindsey Vonn, 27, of Vail, Colo. finished ninth in Tuesday's Zagreb (Croatia) night slalom as Austrian Marlies Schild produced her fifth straight slalom victory of the season. Vonn, who produced the second fastest final run behind Schild, continues to lead the Austrian by 101 points in the Audi FIS Alpine World Cup overall point chase. On the longest women's slalom of the season, Vonn skied despite a harsh stomach illness and did not inspect the first run course. She was 24th after the first run and produced the second fastest final run behind Schild. Heavy fog hampered the entire first run. American Resi Stiegler was 13th after the first run, but mistakes in the second bumped her to 25th. Mikaela Shiffrin did not finish the first run. Kiley Staples and Hailey Duke did not qualify for the final, and Julia Mancuso did not start. The women's World Cup moves to speed with a downhill and super G Jan. 7-8 in Bad Kleinkircheim, Austria. Those races should favor current DH and SG leader Vonn, who held her own in the gates over the last couple of weeks and kept a 641-540 lead over Schild in the overall standings. Sixteen-year-old Mikaela Shiffrin (Eagle-Vail, Colo.) won the second run to capture the first Audi FIS Alpine World Cup podium of her young career with third place in the Lienz, Aust. slalom race Dec. 29. Shiffrin, who became the youngest U.S. champion in history last spring with a slalom victory at the Putnam Investments U.S. Alpine Championships, finished behind Marlies Schild of Austria and Slovenian Tina Maze. It was only the eighth World Cup start of Shiffrin's career and the fifth in slalom. Shiffrin became the youngest female skier to podium in World Cup slalom since Tamara McKinney on Dec. 10, 1978. Lindsey Vonn finished 18th and Resi Stiegler 27th in Thursday's slalom race. Shiffrin said, "I have learned something from so many racers. From Marlies (Schild), who got her 31st win here. From Lindsey, with so many wins in all the disciplines. From the whole U.S team, with all its energy and the positive attitude." Last Wednesday, 34-year-old Bode Miller (Franconia, N.H.) attacked the washboard surface of the rugged Stelvio downhill in Bormio, Italy to finish fifth and overtake the Audi FIS Alpine World Cup downhill lead. Vancouver Olympic downhill gold medalist Didier Defago won the race with teammate Patrick Kueng in second for a historic Swiss 1-2 finish. Miller won the Audi Birds of Prey downhill earlier this month at Beaver Creek, Colo. and was ninth in the season-opening downhill in Lake Louise, Alberta. The American veteran also won the Bormio downhill in 2007 and captured the 2005 downhill World Championship on the venue. Also last Wednesday, Vonn battled the long and rugged Audi FIS Alpine World Cup in Lienz for fifth place to stretch her World Cup overall lead to 231 points. Austrian Anna Fenninger, 22, won the race for the first World Cup victory of her young career. Men: 1—Aksel Lund Svindal (Nor.) 456. 2—Marcel Hirscher (Aust.) 425. 3—Ted Ligety (USA) 385. 4—Beat Feux (Switz.) 360. 5—Bode Miller (USA) 343. Miller leads the downhill standings 174-165 over Klaus Kroell of Austria. Women (after Tuesday's Zagreb slalom): 1—Lindsey Vonn (USA) 641 points. 2—Marlies Schild (Aust.) 540. 3—Tina Maze (Slov.) 390. 4—Anna Fenninger (Aust.) 368. 5—Viktoria Rebensburg (Germ.) 336. 6—Maria Hoefl-Riesch (Germ.) 326. 12—Julia Mancuso (USA) 215. Thursday's slalom at Lienz was the final World Cup start for 15-year veteran and four-time Olympian Sarah Schleper, 33, of Vail. Known for her wildly curly blond hair, Schleper boasted results in 15 seasons including five World Championships and 186 World Cup starts. She raced in a brown dress with flowers on her helmet and stopped midway to pick up her three-year-old son Lasse, then carried him through the remaining gates to the finish. The 5-4, 130-pound veteran of five American world championship teams punched the last gate for good measure. "I had to do something special for my final race," said Schleper who is known for her signature lion roar before leaving the start gate. "After so many race runs, it was time to do something that would be memorable and make people laugh. I am definitely going to miss racing. I still love being in the starting gate. I still love racing and competing. I love all the girls on tour." Lasse (named after Norwegian alpine great Lasse Kjus) will turn four at the end of January and Schleper said it is time to move her focus to him and possibly another child with husband Federico de Gaxiola in her hometown of Vail. "Growing up in a town like Vail is pretty much every ski racer's dream," said Schleper, whose father Buzz owns a ski and snowboard shop in the village. "They've always been supportive of me and the ski racing community. I've been a gypsy since I was 12, but Vail has always been home." 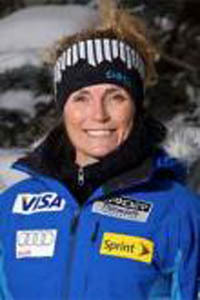 A five-time Junior Olympics gold medalist, Schleper learned to ski and race through Erich Sailer's acclaimed Buck Hill Ski Ski Team in Minnesota. After moving to Colorado, she joined Ski & Snowboard Club Vail (SSCV) at 11 and started her first World Cup just a short five years later. "There have been a number of influential coaches in my career," said Schleper. "My first U.S. Ski Team coach was Georg Capaul, who taught me so much about racing and making a life out of it. Then I won my first World Cup with Trevor Wagner, whose coaching technique was so creative and fun. "But I always have gone back to my mentor in Erich Sailer. He's been there to lift me up at every stage of my career. I've been really blessed with so many wonderful and influential people," she said. "She was a wild young girl with a lot of will and persistence," said Sailer, who began coaching Schleper when she was nine. "But she was also a natural skier. I'm sad to see her move on and hopefully she'll continue to coach. She has been coaching my summer ski camp for the last eight years at Mt. Hood. She loves kids and kids love her." From her first World Cup start in 1995 at 16, Schleper evolved into a leader and mentor on the women's technical team, particularly for Resi Stiegler (Jackson Hole, WY) and fellow SSCV alum Mikaela Shiffrin (Eagle-Vail, CO). Almost magically, Shiffrin, who was born the year Schleper started her first World Cup race, landed the first World Cup podium of her young career with a slalom third the day Sarah skied her final gates in Lienz. "Sarah is my best friend and my soul sister," said Stiegler. "She is truly one of a kind. A brilliantly beautiful woman who has accomplished so much in her life. I am so happy to have been around to have her support, her inspiration and her energy." "Sarah has always been the light of the team, always smiling, always happy, always funny," said Vonn. "She just brings so much energy to the team. I tried to convince her to stay on the World Cup but she says it's her time. We wish her the best with whatever she's going to do in the future. It's not going to be the same without her." Schleper plans to stay in Europe for a few months in order to tour with her family on a route that doesn't involve ski racing. She'll then head back to Vail to start the next chapter. "Now it's about taking 100 percent care of my family," she said. "Federico and I would like to have another child and I'd like to do everything I can to give Lasse every opportunity he needs to live a good life. I know that parents are so important in the lives of champions and I'd like him to be a champion." Schleper, a six-time U.S. champion, does plan to race the Nature Valley U.S. Alpine Championships March 28-April 1, 2012 in Winter Park, Colo.